Home Uncategorized A Long Look at the Port of L.A.
A Long Look at the Port of L.A.
A few months ago, midway through one of the meandering weekend hikes I take with my husband and son, we reached the summit of a ridge in Montecito Heights, an old neighborhood of hills and valleys in Northeast L.A. There was a stiff breeze that afternoon, the sky was spectacularly clear, and we were treated to the kind of panoramic view of Los Angeles usually only enjoyed from the Goodyear Blimp: We watched the stone tunnels of the Pasadena Freeway swallow and spit out glinting motor vehicles; we homed in on Dodger Stadium; we followed clusters of skyscrapers from downtown to Mid Wilshire to Century City; we tracked air traffic at LAX. 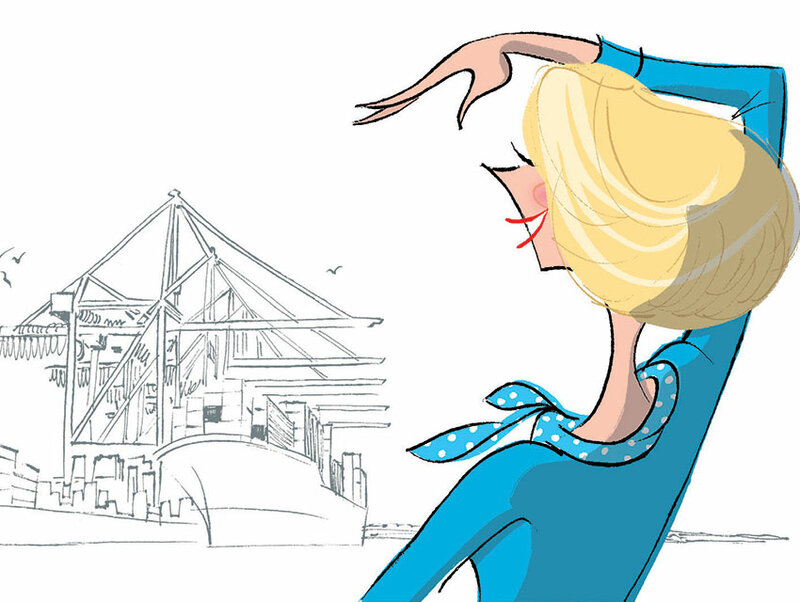 What surprised us most, however, was our ability to spot on the horizon the cranes at work in the Port of Los Angeles. So often described as monstrous praying mantises, they appeared to be actual insect size from this distance 30 miles away. As a tourist attraction and as a metaphor for our region, the Port of Los Angeles doesn’t get enough props. Travelers usually experience it, if they experience it at all, as they scramble aboard cruise liners or disembark in a mad sprint for LAX to catch that last flight home. The transformation of the shallow, mud-choked harbor into the busiest transoceanic shipping complex in America required an act of engineering genius (and city-building will) as dramatic as that which enabled William Mulholland’s aqueduct. The port never inspired awe in me as a kid; I mostly remember feeding fries to the pushy gulls at the Ports O’ Call waterfront village and crossing the Vincent Thomas Bridge, with rows of new automobiles, bright as Legos and fresh off their vessels, neatly lined up on the dock below. As an adult, though, I am floored by the vastness of the operation. The equivalent of 8 million 20-foot cargo containers pass through these waters each year. What’s in that blue one? Or that red or yellow or green one? To tell the story of the port in our May issue, we sent writer-at-large Mike Kessler to embed with the Los Angeles Port Police, whose scuba divers scrutinize hulls for bombs and check containers for illegal goods. It’s a murky, dangerous job. The story also reveals the imminent threat the city could face from computer hacking at the port. Reading the article, I was reminded that my favorite season of the HBO series The Wire focused on the Baltimore ports. I was reminded, too, that when my beloved pickup truck was stolen many moons ago, it gave me an odd sort of comfort to think that it had likely been driven onto a cargo container at the Port of L.A. At least, I consoled myself, my ride had been shipped to some exciting second life, not stripped and gutted in a Valley chop shop. The port is a world of its own, to be sure, but also a gateway to the world.